IMPORTANT: The LED headlamp used to demonstrate the instructions below isn’t DOT approved. DOT approval is an important consideration for both safety and performance. 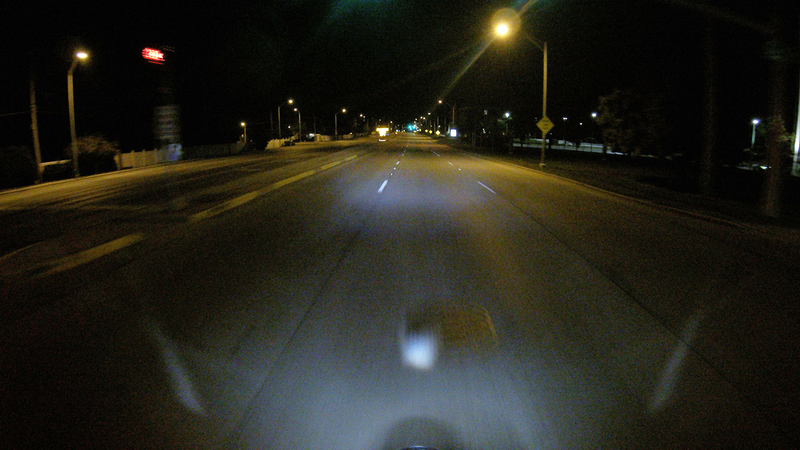 For information regarding 7-inch DOT approved LED headlights, please see this post. 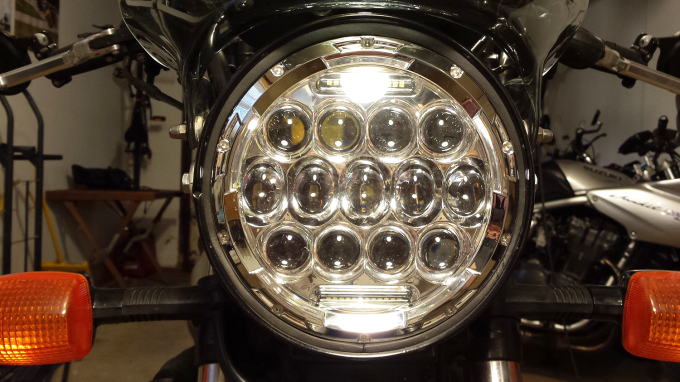 In a previous post, I mention the benefits of LED bulbs in motorcycling. 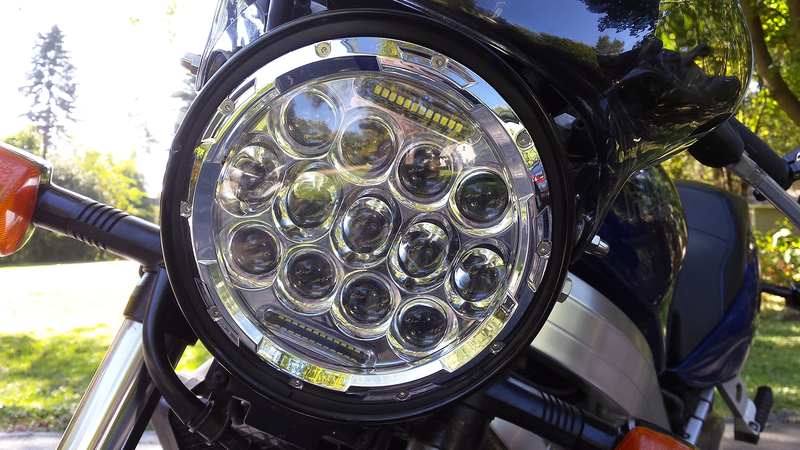 Drawing significantly less power, lasting far longer and activating instantaneously, LED motorcycle headlights are becoming more common in the sport touring market. SuperBrightLEDs.com is answering that demand, making a variety of shapes and sizes available. They’ve even provided the most basic of assemblies in the form of a 7-inch round headlamp with dimensions that are typical to UJMs and others. 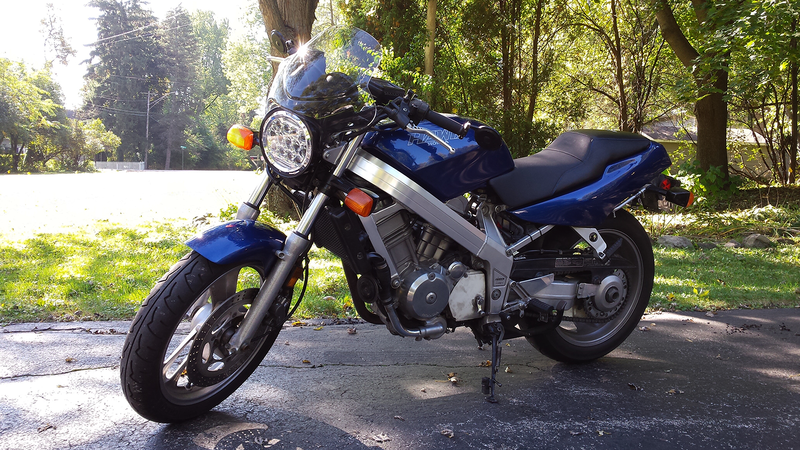 Said assembly is an excellent prospect for our flock’s 1988 Honda Hawk GT. The Hawk GT, my local rider, also functions as my wife’s long distance sport tourer. Unlike most ST bikes, “Big Bird” has a naked profile (no fairing) and a fork mounted light housing. With stock-respectful modifications in mind, none of the bike’s parts are hacked, ground or repurposed. Whenever we note a change we’d like to make, the stock part is carefully removed and stowed before being replaced by whatever modern installation we’re focused on. Within that logic, SuperBrightLED’s H6024 fits the bill. Optionally intended for use as an automotive rack light, every package includes easy-install mounting hardware. Motorcycles having their model-specific differences, any attempt to use this mount with a standard light bucket overcomplicates things. 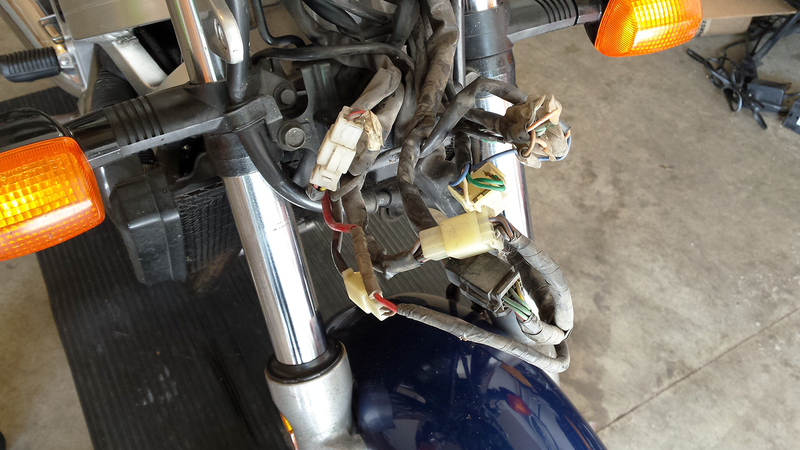 Finalizing a new mounting scheme for your motorcycle may take a few attempts, complete with the occasional mistake. 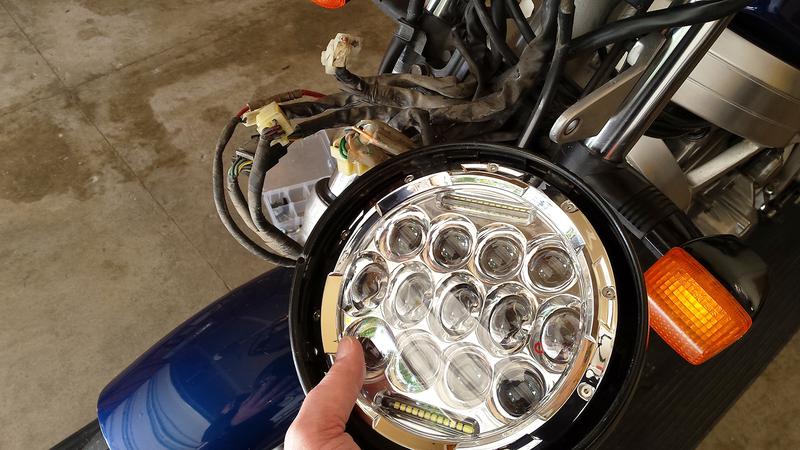 Before installing the LED headlight, consult your motorcycle owner’s manual for instructions on how to remove the stock assembly. 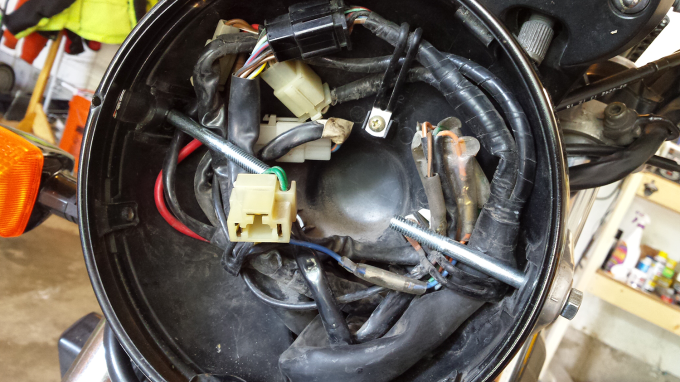 You may find it worthwhile to remove the stock headlamp bucket entirely for cleaning. Electronics cleaner might prove useful should the wiring be dusty. To prepare the LED headlight for installation, one minor alteration must be made to it’s wiring. First, install your t-tap connector onto the motorcycle’s low beam circuit. 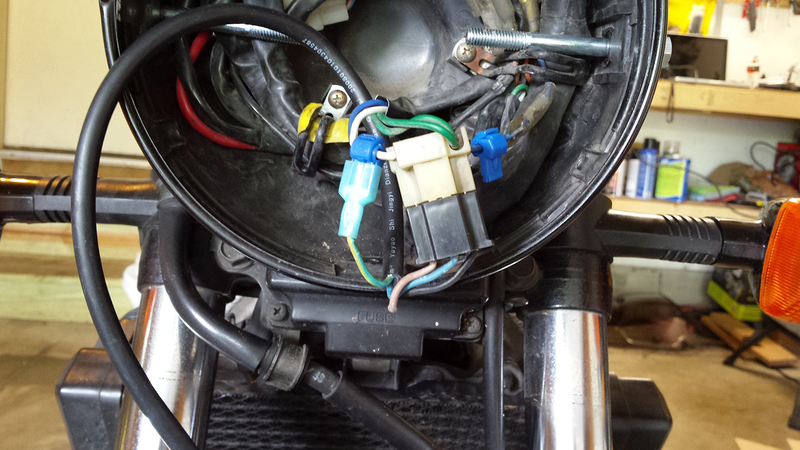 Then, remove (cut away) the smaller blue wire connector from the LED assembly itself, replacing it with your newly purchased quick disconnect. This adaption allows the motorcycle headlight’s LED circuitry to detect wether or not your low beam is active. Because directional LEDs are less visible to oncoming traffic than the latter, LED strips above and below insure you’re more conspicuous. 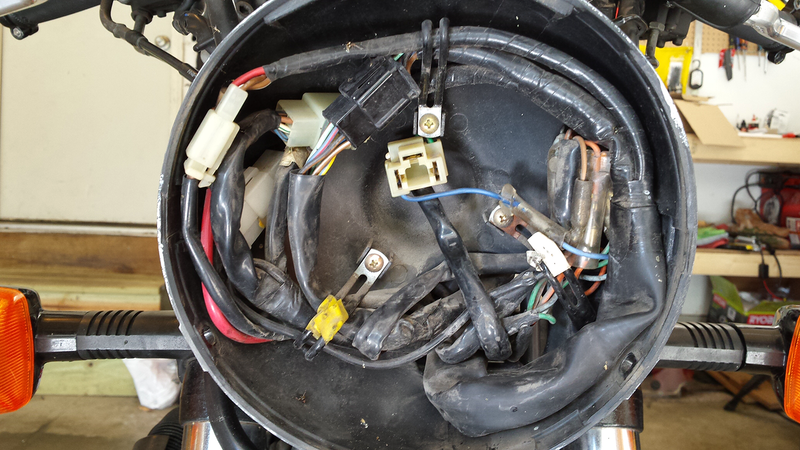 Note: For the Hawk GT, look for the white wire, shown above left of the stock connection. 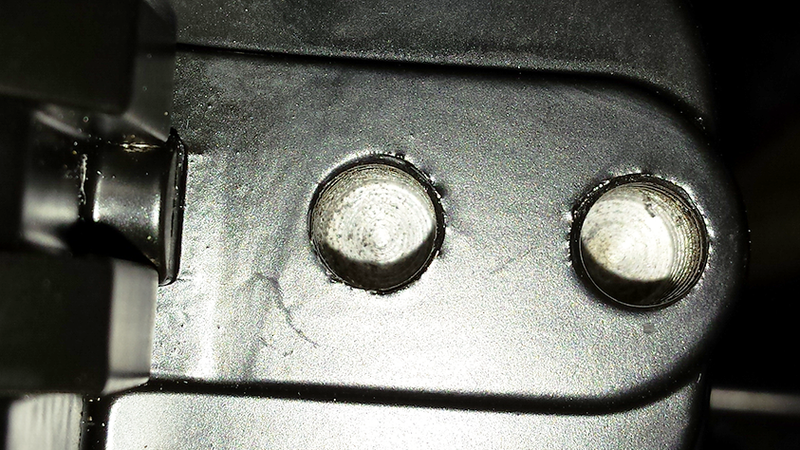 Our LED headlight sports two threaded holes on either side. One sits toward the front and the other slightly farther back. My original installation (documented during the wrenching portion of the video below) makes use of the rear set. I eventually decided the forward set to be a better choice as it bolsters stability. While they’re harder to line up due to limited bucket depth, the look and feel is noticeably more sturdy. As for how it’s mounted, the keyword is: spacers. PEX pipe is both strong and easy to work with … perfect for our spacers. First, we’ll need measurements. Get the interior width of your light bucket from one mounting hole to the other, writing the result down as figure “a”. Next, measure the outer width of your LED assembly from one aforementioned mounting hole to the other, writing the result down as figure “b”. 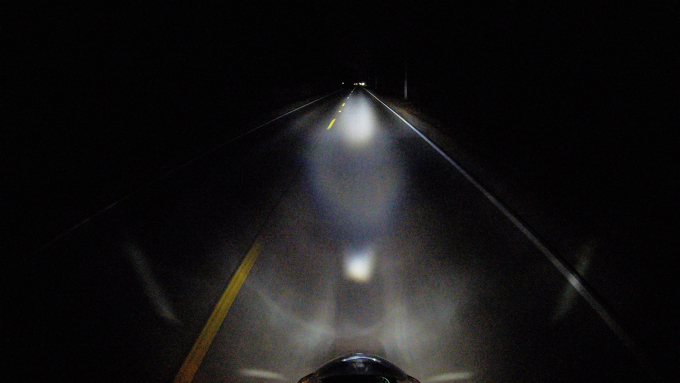 Drawing less power, lasting far longer and activating instantaneously, LED motorcycle headlights are becoming more common in the sport touring market. Figure “a” minus figure “b” divided by two equates to your required spacer length. That’s (a – b) / 2. In the case of our Hawk GT, we’re looking at 47mm. Measure twice and cut once! In all honesty, the entire available space occupied by the PEX pipe should not only be filled, it should be a little bit tough to get the spacers into their correct position even without the bucket screws in place. Now comes the (perhaps) “easier said than done” part. Mirrored opposite one another, the installation pattern from left-to-right | right-to-left is “bolt through washer through mount through bucket through washer through spacer into LED assembly at frontmost mounting hole”. Fear not, for the video makes sense of things and, come to think of it, it’s actually “easier done than said”. If (like us) you use a third party windscreen, don’t torque anything down just yet. Position all that’s to be installed first. We’ll secure each part soon enough. You may notice some resistance from the LED headlight assembly’s threads. This is due to them having been painted at the manufacturer. Be sure everything’s lined up and carefully dig in. Before we finalize things, cellular rubber weather stripping acts as an impressively functional dust seal that’s aesthetically pleasing to boot. I mention this having tried a number of other options including adhesive foam strips as well as vacuum hosing. Applying this to your headlight bucket’s outer ring before gently working it over the LED bulb is a simple process, albeit a little slow going. Now it’s time to torque things with a mechanic’s feel to “aluminum tight”. Don’t over do it! Our LED headlight assembly has aluminum threads with limited depth, meaning that it’s not through-and-through. 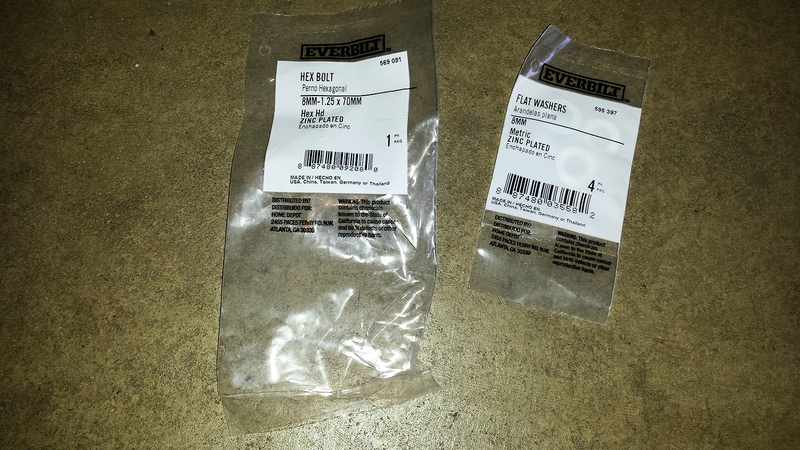 Rather, it has a flush limit which marks the end of how far our 70mm bolts can go. Assuming your PEX spacers are of the correct measurements, there should be no “egging” (warping or egg-like reshaping of the surrounding light bucket). 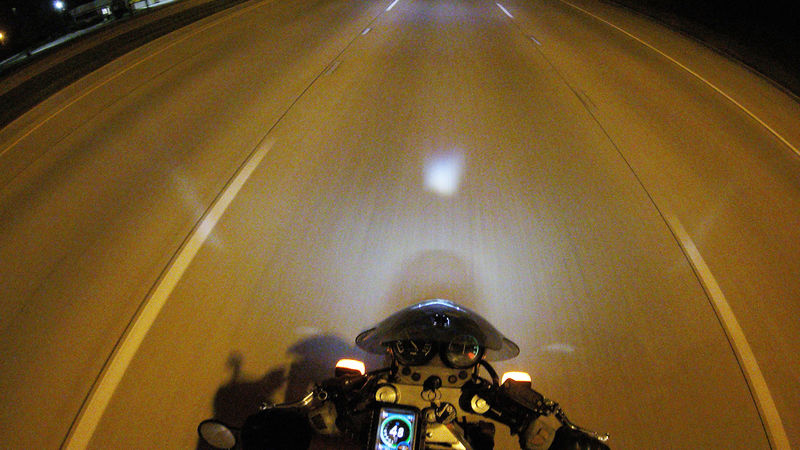 Tightening and buttoning everything up eliminates any involuntary shift in our LED motorcycle headlight’s y-axis which is subdued even further by using the forward most mounting outlets. Take it around the block and see for yourself! The 7″ LED motorcycle headlight being marketed by SuperBrightLEDs.com is of excellent quality. Structurally durable, it projects a long range beam and somehow non-glaringly highlights street signs far better than the competition. Even our GoPro Hero4, which doesn’t do well in dark conditions, proves that range of sight and oncoming visibility are both far greater with this installation than with a standard or even halogen headlamp. Some of the reflective street signs in the video below are over a hundred yards away. In short, we’re greatly impressed! For the record, Travis Burleson did NOT help me (at all) with this article. Well, that is with the exception of previous experience, hands on assistance, countless trips to the hardware store, basic tools, accuracy tools and a total indifference to my empty promise that I’d help him remedy an oil leak on his CB1000. Yeah. Alright. I guess I owe him a bit of thanks. What LED Lighting Do You Use? The ability to see and be seen is essential to safer motorcycling. What LED installations are you familiar with? What do you like about them and why? Your input is invited. Post an article! It really depends on the form/dimensions of your motorbike’s headlamp bucket. Even today’s modern motorcycles (be them faired or naked) tend to incorporate headlight enclosures that are unique to their make and model. Fortunately, an image search for the motorcycle you mention suggests that you do in fact have a round headlight. Assuming that’s the case, it’s just a matter of measuring. The bulb above requires a 7″ housing. What makes things easier is that said bulb has two threaded outlets per side (two mounting points), making the forward/rear placement semi-adjustable … more adaptable! As for price with shipping, you’ll have to take that up with either the reseller (SuperBrightLEDs.com) or their manufacturer. I bought my ‘06 suzuki boulevard m50 and the previous owner had dropped it which destroyed the headlight housing. I have to get a new housing and want to use this headlight. I can mount it on the forks. 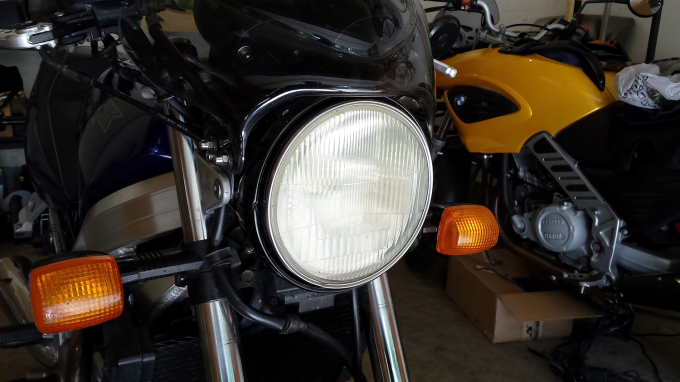 Do you know which headlight housing would fit this headlight with a side fork mount? Thanks! Congrats on your purchase. I responded to a similar question some time ago. Click Here (jumps directly to that reply). CRC 05101 QD Electronic Cleaner - 4.5 Wt Oz.